Michael Jennings is looking forward to getting stuck into a busy start to the year for his stable of fighters. Chorley’s former British welterweight champion – who also challenged Miguel Cotto for the world title in New York – trains Matty Askin, Adam Little and Mark Jeffers at his gym in Coppull. All three are likely to be in action in March as they look to kick on in their respective careers. First on the agenda is Kirkham’s Little, who fights in Bolton on March 2, in what will be his first outing in 17 months having been given the all-clear to fight after issues with a brain scan. The super-lightweight, 18-2, is a former English champion who is hoping to get back in the mix. “Every lad that we’ve got is different,” said Jennings, who works alongside brother Dave at Jennings Gym in Coppull Mill. “We’re going to be busy over the next couple of months making sure the lads are fully prepared. “I don’t think Adam could have been any more unlucky. “He’s got all the tools and just needs a break. He’s out on March 2 and if he gets a win then he will be out again two weeks after that as long, as he comes through unscathed. “After that if we get a shot for Adam to fight for any sort of title then we’re willing to have a go. Unbeaten Eccleston middleweight Jeffers is looking to make it a perfect 10-0 in Bolton on March 9 as the 20-year-old closes in on domestic honours. “Mark is younger than the others but we are looking to step him up,” said Jennings. “He’s got a six-rounder on March 9 and then we’ll look at a eight-rounder after that and then we’ll look for some sort of title, maybe the Central Area belt. “It’s a big title for someone of Mark’s level and you can get other fights off the back of that. “It might not be from the big promoters but as the champion he would get offers. 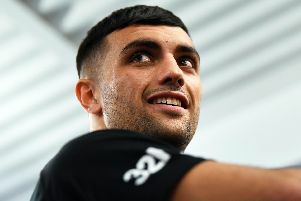 Blackpool’s Askin is looking to rebound after losing the British title in an ugly fight with Lawrence Okolie at Wembley Stadium in September. The 30-year-old is looking at a warm-up fight in March before heading to Brussels to take on Joel Tambwe Djeko on May 4. “He’s hoping to get out in March and then there’s the fight in May,” said Jennings. “A good win there would get Matty’s rankings back up.